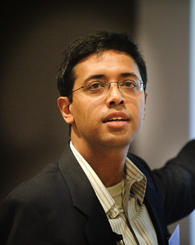 Ahmed Mushfiq Mobarak is a Professor of Economics at Yale University. He also co-chairs J-PAL's Urban Services Initiative, and he leads the Bangladesh Research Program for the International Growth Centre (IGC) at LSE and Oxford. He has previously worked at the World Bank, and at the International Monetary Fund. He is a development economist with interests in environmental issues and has several ongoing research projects in Bangladesh, Brazil, Chile, India, Indonesia, Kenya and Malawi. He conducts field experiments exploring ways to induce people in developing countries to adopt technologies or behaviors that are likely to be welfare improving. His research has been published in journals across disciplines, including Econometrica, Science, The Review of Economic Studies, the American Political Science Review, Proceedings of the National Academy of Sciences, and Demography, and covered by the New York Times, The Economist, Science, NPR, Wired.com, the Times of London, and other media outlets around the world. Sure, We Can Build a Better Toilet. But Will People Use It? Does Development Aid Undermine Political Accountability in Bangladesh?